Super R™ Radiant Barrier reflective insulation products can reduce attic temperatures by up to 30 degrees when installed to the underside of roof rafters. 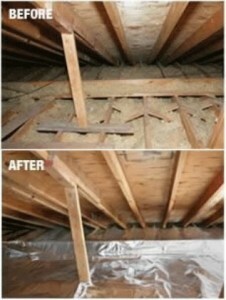 Lowering attic temperatures provides a significant benefit by reducing air conditioner loads and energy usage. The University of Nevada Las Vegas conducted independent research and discovered that radiant barrier insulation can reduce energy consumption by up to 35% during peak hours in the summer and by up to 29% over extended periods. Our radiant barrier foil insulation products are made from 99% pure aluminum making them the best at blocking 97% of the radiant heat that attempts to enter building structures. Super R™ Radiant Barrier is a high quality, double-sided, tear-and puncture-resistant radiant barrier product. All Super R Radiant Barrier™ products meet the Standard Specifications for Sheet Radiant Barriers for Building Construction Applications ASTM. Radiant barrier insulation is a reflective insulation system that offers a permanent way to reduce energy costs. Radiant barrier insulation systems reflect radiant heat energy instead of trying to absorb it. A pure aluminum radiant barrier reflective insulation is unaffected by humidity and will continue to perform at a consistent level no matter how humid it may be. A radiant barrier insulation system is a layer of foil facing an air space and is installed in the envelope of a building. Most people are familiar with traditional insulating materials such as fiberglass, cellulose, Styrofoam, and rock wool. These products use their ability to absorb or resist (slow down) convective and conductive heat transfer to insulate (R-value). A third, seldom discussed but dominant form of heat transfer exists: radiant heat transfer. What are the differences among the three forms of heat transfer? ► Conductive: Direct contact. If you touch a pot on the stove, this is conductive heat transfer. ► Convective: Steam, moisture. If you put your hand above a boiling pot, you will feel heat in the form of steam. This is convective heat transfer. ► Radiant: Electromagnetic. Step outside on a sunny day and feel the sun’s rays on your face. You are feeling radiant heat transfer. All objects above absolute zero (-459.7 degrees F.) emit infrared rays in a straight line in all directions. A radiant barrier reflects radiant heat energy instead of trying to absorb it. What does this mean in your home or business? During the winter, 50-75% of heat loss through the ceiling/roofing system and 65-80% of heat loss through walls is radiant. In the summer, up to 93% of heat gain is radiant. If you are depending on R-value (resistance) alone to insulate against heat gain and loss, remember that thin layers of fiberglass are virtually transparent to radiant energy and are affected by changes in humidity (moisture levels). A 1-1/2% change in the moisture content of fiberglass insulation will result in a 36% decrease in performance (referenced from HVAC Manual 10.6; McGraw-Hill). A pure aluminum radiant barrier is unaffected by humidity and will continue to perform at a consistent level no matter how humid it may be.